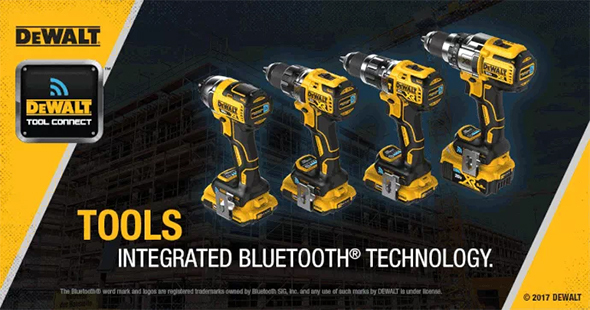 A few months ago, Dewalt teased us with an announcement that they would be coming out with new Dewalt Connect Tools which featured integrated Bluetooth technology. We haven’t heard a peep out of Dewalt since then, at least about anything Tool Connect related, but a few new products popped up on Dewalt.com. There’s quite a bit of information there. To start, the initial launch will focus on drills and drivers, but we already knew that. 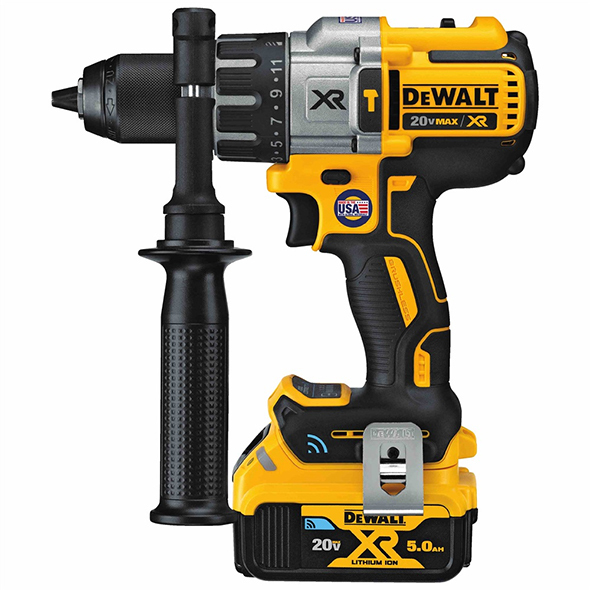 The listings on Dewalt.com are for the drills, with no new information about the Dewalt Tool Connect impact driver. Please keep in mind that some of this information is subject to change as the launch nears. There are listings for several purchasing options – bare tools (e.g. DCD792B), compact battery kits (e.g. DCD792D2), and the premium hammer drill will be available as a bare tool or in a kit with Tool Connect battery packs (DCD997P2BT). There might be other options or bundles as well. Following are 5 things we just learned about Dewalt Tool Connect tools and tech, and then a few lesser things that have become clearer since the original teaser announcement. On the drills, users will be able to program in 3 customized RPM settings. There’s no mention about whether you can set any torque limits. Users will also be able to customize the brightness and “afterglow” delay of the built-in LED worklights. 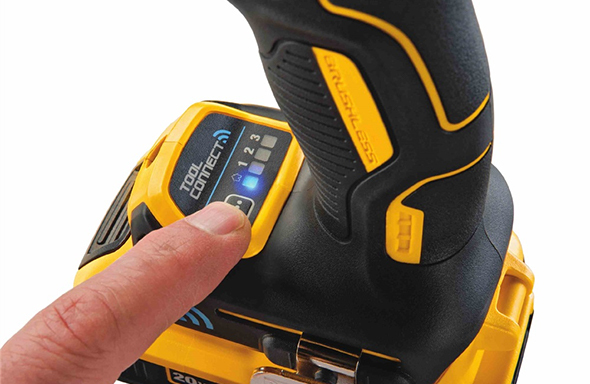 As mentioned in our Dewalt Tool Connect preview, there will be a new Connector, which allows you to “connect” any 20V Max tool. The Connector permanently attaches onto the foot of the tool to prevent removal. Then, your current 20V MAX* battery simply slide into the Connector. The ultra-slim design does not interfere with the tool’s ease of use and adds virtually no additional weight. Okay, so the Connector permanently attaches to the foot of your 20V Max tool. It presumably has a coin cells, similar to those in the new Tool Connect tools to allow for tracking even when a 20V Max battery pack is not connected. It will also send you tool diagnostics. Unfortunately, there’s no mention of being able to customize your existing tools. Bummer. I’d love to disable the red light on my Dewalt 20V Max LED spotlight sample, which I reach for more than others. The Tool Connect Last Seen feature: helps reduce wasted time and money by providing the street address of where your [Tool Connect tool] was last in range of your Tool Connect enabled device. One of the features listed for the Connector is that you can set to disable the tools once they are out of range. That’s perhaps why the Connector is a permanent attachment. This seems like a good feature, and if anyone disagrees, consider that it’s better to have it and not want it than to want it and not have it. If it’s not something you want to use, simply don’t enable that feature. There’s also the battery packs, which I guess would be an existing way to connect. The little sticker right next to the trigger switch says it all. 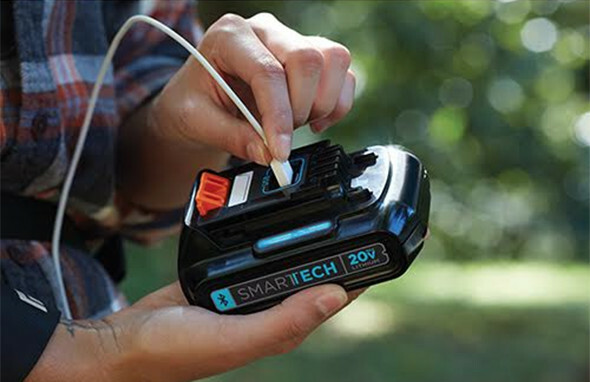 As with Milwaukee’s One-Key tools and Tick tracker, the Tool Connect tools will have coin cell batteries, so that tracking is enabled even when a battery pack is not connected. 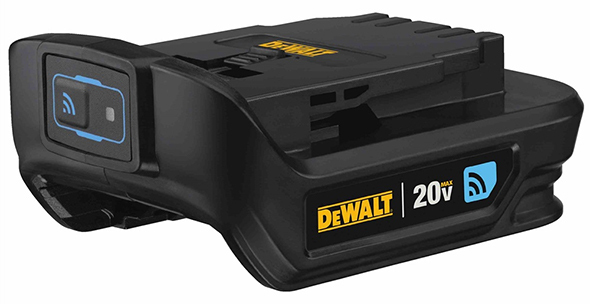 2 years ago, Dewalt announced new 20V Max Bluetooth battery packs, which offered some remote monitoring and control features. It looks like there’s a new breed of Tool Connect battery packs that are fully compatible with the new system’s features. Well, maybe not new battery packs, but at least new features. It is unclear as to whether the 4.0Ah batteries – the first Bluetooth-equipped batteries – will be fully compatible with the new app. 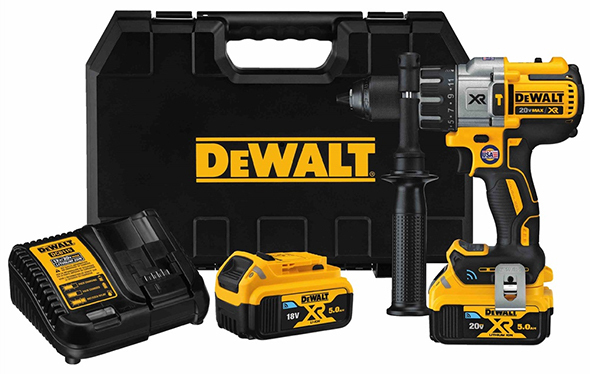 The new Dewalt Tool Connect premium hammer drill kit, DCD997P2BT, comes with (2) DCB205BT battery packs, which are already on the market. One of the features for these batteries is track and manage, and so the battery packs might be trackable as are the new tools. There’s no new information about the Dewalt Tool Connect TAG tracking accessory. I presume it will function in the same way as Milwaukee’s One-Key Tick tracker. Easily and quickly assign tools to jobsites and users on the Tool Connect Inventory Manager software, increasing accountability and reducing lost tools. This is something that will be nice to have as a web app that can also be accessed from tablets, laptops, or desktop computers. We already knew inventory management was coming to the app, so this really isn’t anything new. The app will tell you things like internal coin cell battery life, temperature (of the motor or battery pack? ), number of trigger pulls, and how long the tool has been running. Is the number of trigger pulls something that users will be interested in knowing? 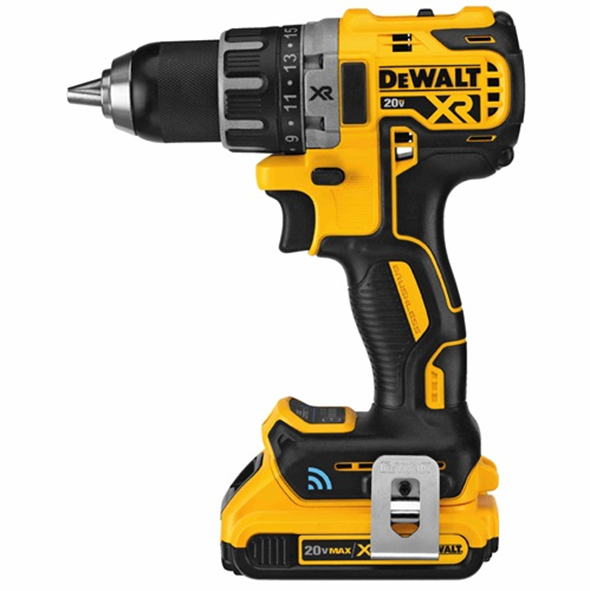 I’m still hoping that the Connector will allow for customizations of existing Dewalt tools, but that’s probably too tall of a wish. I also find myself hoping for a little more, but this looks to be a great start. Milwaukee announced their One-Key product family at the same time that Dewalt announced their Bluetooth battery pack. 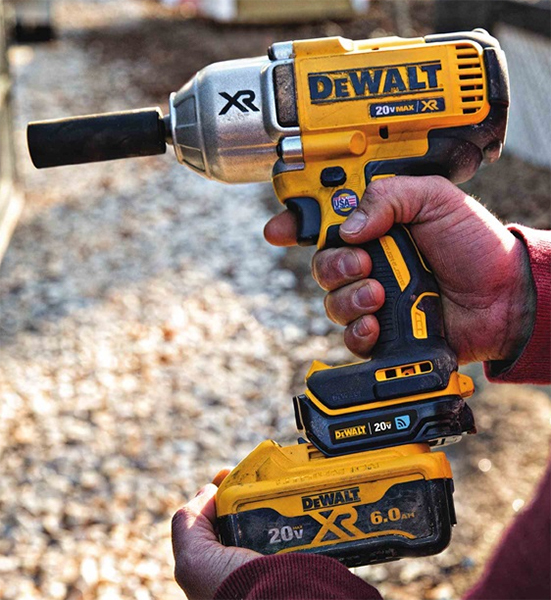 Many of these new Dewalt features and products seem to do the same thing – or similar – as Milwaukee One-Key counterparts. It’s not appropriate to jump to the conclusion that Milwaukee is the leader and Dewalt the follower, even though it certainly appears that way. 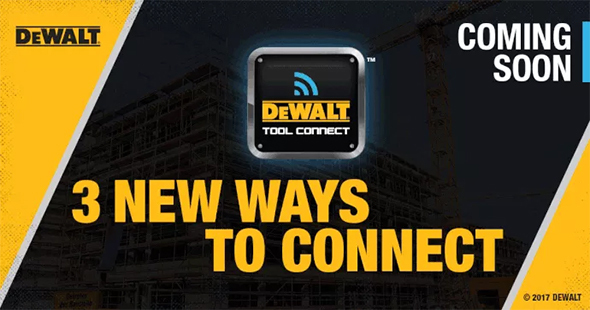 My best guess is that Dewalt had some of their Tool Connect products and features already on their roadmap, with perhaps some being influenced by Milwaukee One-Key. But if so, that would have helped to make them potentially better. For instance, their tracking feature is called Last Seen. That, and its description, is a lot clearer to me. I too had been seeing Milwaukee’s Tick as a potential theft recovery aid, and mentions of it helping in recovering stolen tools didn’t do much to convince me otherwise. It took seeing what the Tick can do and NOT do for me to realize its limitations and user network dependency. The benefit in being “later” with tech like this is that Dewalt had more time to learn and refine their products. Hopefully the tools will be reasonably priced. Right now, there’s no pricing info. More details will be available as the tools get closer to an official launch, or at least an official announcement. Part of me is always wooed by new tools and tech, but the calm side of me is growing increasingly enthusiastic as well. So now there are 3 professional tool brands offering customizable and connectable tools, and tracking technology. 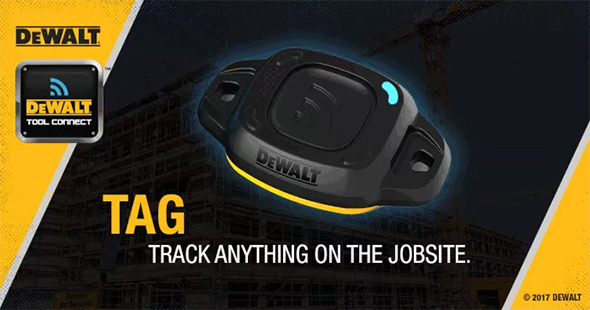 Milwaukee, Dewalt, and oh yeah – Bosch, if they ever get around to releasing their customizable tools and TrackTag tracking device in the USA. There’s no word yet as to whether the Dewalt tracking technology will require a subscription or not, but I anticipate that it will be free. The One-Key Tick tracker is on sale at several retailers this week for $10 (so much less than even a multi-pack even). Home Depot & Acme for sure. I hope as many people as possible purchase, or at least install the app so the when it does come to find a stolen tool, there will be that much more potential to find it. I tried looking for it, nothing came up. Maybe it was newly added or I didn’t look hard enough. I’m not finding anything on the website regarding any of these tools. Do you have a link to these? I asssume that DeWalt considers the 5ah and 2ah batteries a current product since they are updating them. I was thinking they would have upgraded to 3ah and 6ah but their 6ah uses bigger batteries thus making the pack bigger than the 5ah. I like the new stickers on the batteries, but I’m guessing they are the same as the old batteries. It’s likely that the pages went up a little early and were taken down until the tools are closer to launch. When I read your heading “Coil Cell Batteries” – I thought I was in for something really new. I shouldn’t be chuckling – between autocorrect, never having learned to type and my fat fingers – I need a prof-editor more than most. I proofread everything , but these days it seems some browsers want to autocorrect for me, and things are changed for me. I don’t know if that was the case here, or if I glitched. I’d never buy the tool connect connector, it makes the tool nearly an inch taller, looks awkward. It might not weigh much but now the heavy battery is an inch further from the tool making it feel heavier. I’m also pretty sure that you’d be able to remove that by taking the drill apart. If not, certainly you can cut through the adapter and with enough work remove it. Anti-theft is therefore no more beneficial than a padlock. locks only keep honest people out. Which device is that? A central hub? They had something like that before, a small security attachment for large boxes or equipment. But I didn’t see anything like that for Tool Connect. Update: I’ve looked and looked, and all I found is an older product. There is no Tool Connect product that matches what you’re describing. From what I can tell, the Tool Connect app is completely free, and absolutely none of the new tools or accessories they’re launching require a fee of any kind. Perhaps you’re talking about MobileLock? That is NOT a Tool Connect product. That is a completely different product. BTW – I saw some statistics a few years back – that Texas was the leader ( a dubious honor) in construction equipment theft – and that North Carolina and Florida were about equal as second-place contenders. For the top 10 states (in reported thefts) – over 7200 pieces of equipment were reported stolen in a year. The most common items stolen were riding mowers and garden tractors (over 5000 stolen) but skid steers were apparently also a popular target for thieves (over 1300 stolen). I know of a case where a crane was apparently used to lift a piece of equipment out of a construction yard – over its “security” fence and steal it. The thief was apparently both brazen and skilled. What a waste of money. If someone were to steal my tools , they would be much further than 50 feet before I notice them gone. The whole category of connected tools doesn’t strike me as something with mass appeal. I don’t see the value for someone like myself, a DIY/Woodworker and most contractors require their crews to supply their own small tools like drills. I’m in New York, maybe in other markets things are different. Need my ratchet to have internet access . I’m with you on that, I’m a gadget guy but just don’t need these type of gadgets. 1. The thief will keep this thing on the tool. And no, it’s not “permanent”, thieves break steel locks all the time, some plastic lock mechanism is a 2 second job for them. 2. The thief will stay within what? 40 foot range? Ha ha, good luck with that. The only way this could work is if that thing disables the tool permanently once it’s out of range. I mean like fry the tool or something. That would make it useless for the thief, but also for the owner, so that’s probably not a good option either. But it’s certainly better than this, because you can at least make sure the thief doesn’t get much from it. I’m still trying to figure out a useful purpose for all of these connect tools & I’m still not seeing anything. What is anyone accomplishing by connecting Bluetooth to their drill? How does any of this wireless connectivity improve the performance of the tools? It doesn’t give it more power. It doesn’t make the battery last longer. What it does do is provide you with %100 useless information sold at a premium price. As I’ve said before, they keep implementing the most useless technology with these tools. Nobody has ever cared about battery temp or running time or trigger pulls. Nobody ever will. The batteries already have a gauge on them, so why would I waste time connecting to some app. They really need to just pull the plug on all smart connected power tools. Power tools aren’t meant to be smart. And wireless technology has nothing viable to offer power tools. Their R&D needs to focus efforts on making durable built to last tools, not wireless gimmicks with bells and whistles & way too much hype. Hi we use the bluetooth batteries. We lend them every 2 months, employees know that they will be useless after that, so are returned to be re lent. When they come back condition is also checked. If stolen they are of no use and can be traced, if taken to secondhand dealer. Once tools are embedded the same will apply. Keeping track of tools and condition is a major cost on construction. I believe that the recovery rate for stolen tools and equipment is abysmally low. There is a National Equipment Registry – that purportedly helps you recover, but I never met any contractor that had good things to say about it. We would lock things up in our Knaack boxes on larger jobs – sometimes bolting the boxes to the floor – but almost always never bring a box that had wheels on it. On big job sites, if a cordless tool was not in a locked box, and was left laying around – out of sight of its user – it would likely get filched. The fact that stolen tools probably get sold via otherwise legitimate internet outlets is not good. The fact that otherwise honest folks look for these bargains knowing that they may be buying stolen tools is not good. What this says about our society as a whole is even worse. Sorry to be pessimistic, but my take on these Dewalt and Milwaukee “anti-theft” technologies is that if it adds cost to the tool – then it just means that if the tool gets stolen you are out that additional cost. Dewalt says…your tool can found within 50′ of wherever your tool is…..via GPS and a Verizon subscription 19$ month……that’s anywhere USA….not just in Bluetooth range…. ..so I doubt a thief is braking the tools to get the device off as soon as they steal them…I’m sure they just threw the tools in the truck/van and sped off…..your tool notifies you it’s out of range 40′ ? And then you track it on gps and call the cops….they just might get caught…..
Respectfully, this information is absolutely incorrect. Tool Connect will not have it’s own GPS, at least not any of the products I know will be launching, or any type of subscription fee of any kind. Please see my comments above. You are mistaking a completely different product for Tool Connect. If they were concerned loss & theft, why did they come up with the idea for the device to be placed externally & easily removed & only works when the app is running in close proximity? There’s far better tracking & locating tech available, but they’ll never use it. Every time someone’s tools get stolen & replaced, they’re making money. Do you really think that they want to make a valiant effort to stop generating profit just because of thievery? So they hype up the dog & pony show with some bogus tracking device & make it sound like its some new technology. The sad part is that they all have more than enough $ to put satellites in the sky for effective tracking & locating. But there’s too much money to be made off of theft. So as long as people keep stealing from each other and losing tools, not much is going to be done to stop it. Why can’t tool company combine sim card ($5/mo), GPS, and a Lost&Found app to make the tool much easier to track like a $25 disposable cell phone? Pay monthly for each tool … I bet the tool companies like the sound of that . I don’t much like the idea myself . I’m actually wondering if I can put one of the tool connect tags on my dog’s collar and find him with my cell phone when he runs away. He might be out of range, but when I’m driving around in my truck looking for him I’ll know when I get within 50 feet of him? I know most of the bars where he hangs out, so I can get close, just need to be alerted when he’s nearby (hidden in the bushes).